The aim of this new journal is to enhance the knowledge and the know-how required for responsible action in the global economy of the 21st century. The global economy is likely to induce and experience transformations that we currently can hardly imagine. It will be characterized by complex networks combining local, national and global linkages, and by surprising interactions between the economy and its political, social and biophysical environments. In view of these new possibilities, the journal wants to preserve the insights developed since the days of Adam Smith in modes of analysis based on the conceptual device of representative agents. It will emphasize the opportunities provided by newer approaches to dynamic social networks, where actions are attributed to heterogeneous agents ranging from physical persons to multinational organizations, and where rationality has more aspects than the classical logical coherence. In view of this perspective, multi-agent modeling of complex economic networks will be an important focus of the journal. 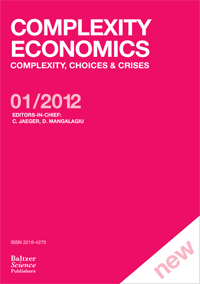 Articles of the first issue can be accessed free of charge on: www.complexityandeconomics.com.